Here come the workmen, with Borough Surveyor at their head. They are equipped with the tools of their trade: “pick, crowbar, and shovel, scaffold, poles and chains”. All day they have been readying themselves and the site, checking their instructions. And now, with the day’s business nearly ended and tea-time hour approaching, it is time to begin; to “resurrect… antiquity”. Watching men at work is for some a most delicious pleasure. The poet Wordsworth, for example – he could do it for hours. But there are no Wordsworths among us today, although granted the chap from the Cornishman has a fine turn of phrase. Quite puts the old Telegraph in the shade these days. After all, who wants to read about “conventual property” back in the time of William the Conqueror? Not many in Penzance, we may be sure. The occasion has indeed attracted “a large and interested throng”. And these are not exclusively your gentlemen of leisure - loafers, idlers, scribblers. There are ladies present, including Miss Couch the Mayoress. As one might expect, the antiquarians have turned out as a body. Mr Preston is taking photographs. And here is “Rev. W. Jago, probably the leading antiquarian of the county, and whose researches have won for him a national reputation”. Once the lifting is started, the business is over in a few minutes. By 5.00, we can all see the back of the stone. And I must say, it’s a disappointment. Hardly worth waiting for. "Is that all there's to see?" asks one little lad. The speedy execution of the lift – thanks to “the efficiency of machinery” and the Borough Surveyor’s care – has in truth been far more remarkable than anything it has plucked from the mists of antiquity. The stone is placed onto a trolley, and the spectators stand back respectfully as the Rev. Jago applies a wet broom to the cross, gives the granite a good scrubbing. And why should he not bring it to a state of cleanliness? Surely our relic deserves no less? Here’s some figures for you: 360 crosses in Cornwall, they say – and only eleven with inscriptions. Tomorrow, before he returns to Bodmin, Jago is to examine the stone carefully. And who knows what he may find? Will he be able to confirm Mr Le Grice’s findings from all those years ago? Will he read, as his predecessor did: “Hic procumbent corpora piorum"? Will he find a picture of St Anthony, or the crude image of a pig? We shall see. So here goes the old cross, on its travels once again. 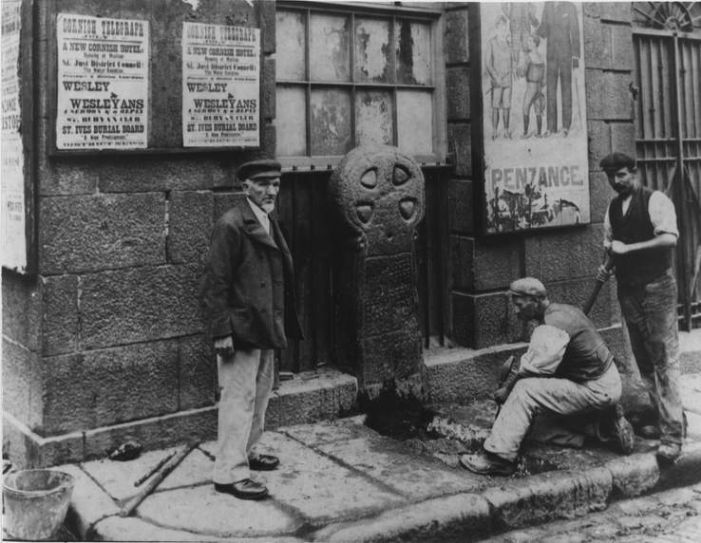 It’s been in the Greenmarket, and it’s been next to the old water-shoot down at the bottom of Causewayhead - as the Trounson brothers, total age 165, and both still blessed with the strength to stand and watch the proceedings, could testify. For thirty years now, it’s been in front of the old Town Hall, watching the bicycles swerve round the corner, the carts jostle, the market business being carried on. Now it’s off to a temporary resting-place in the Morrab Gardens – tomorrow, in the new century, who knows? Will the memorial to those ‘pious souls’ their names long-forgotten, ever find its own “suitable and permanent resting place”? 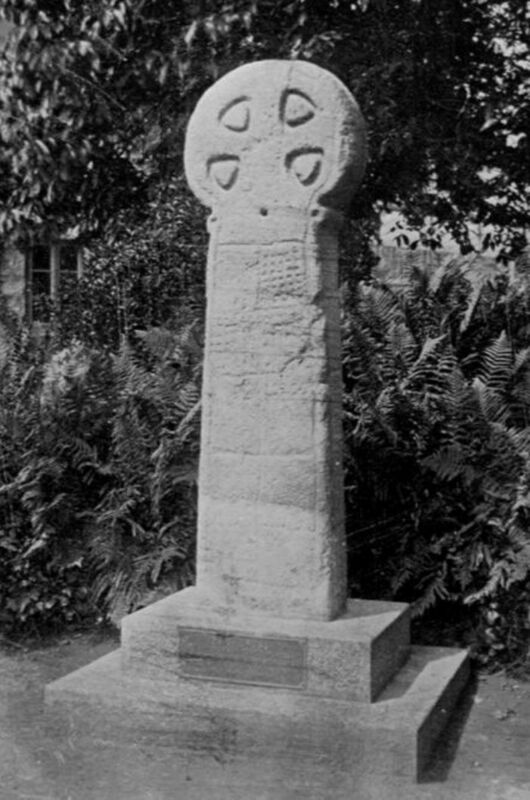 See also Penzance Market Cross, a Cornish Wonder Re-wondered, Charles Thomas, undated but probably 1999, pp 10-12. Thomas says that the Borough Surveyor at the time was a G H Small, but the newspaper account names Mr Latham – who at that date would have been just beginning his splendid work for the Borough, which culminated in the Jubilee Pool.